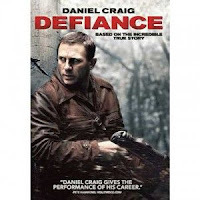 We are back with a review of Edward Zwick's 2008 film Defiance. The film recounts the story of a partisan band in Belarussia that fought against the invading German Army during World War II. The film is [somewhat loosely] based on historical events and the unique aspect that this group of fighters were Jews, led by the Polish Bielski brothers. This is an engrossing account of a small group's courageous struggle against an unrelenting foreign enemy and barely sympathetic, anti-Semitic countrymen, while at the same time striving to honor and preserve the morals and traditions of their heritage. Defiance features memorable performances, skillful direction, and an excellent score by James Newton Howard.